The third axis is the one that concerns me. Looking at other countries who are in the process of deleting zeros. It seems to me the only countries that have lost 3 zeros are the ones that have lopped. I agree sq2 Israel's desalination plants are revolutionary. They have reached out to 3rd world countries to help with water shortages around the world. My husband, Bob, who is a CPA, MBA, CFO of his company feels that this investment definitely falls into capital gains category and should be taxed accordingly. Are you sure they are referring to the HCL in this consensus among the Kurds? Or are they just in agreement on how the Kurds will form their territorial government? Is this a law being passed on the 18th that will pave the way for Erbil and Baghdad to then pass the HCL? Usually these guys don't meet face to face unless its a done deal. Icing on the cake! Perhaps this article is saying that the HCL has been submitted(passed on ) to parliament with new wording that they hope all sides will agree on. Russia announced in August of 1997 that they would be lopping 3 zeros off their currency starting in January 1998 and would change out bills until January 2002. They also announced they would bring back kopeks (their coins) Instead they only allowed 2 weeks for changing out the currency. About Newshound guru Breitling's post . I was in Russia shortly before they lopped. We were adopting 2 little girls and had to exchange all of our cash for the adoption into Rubles. We were millionares!! We were told to be cautious about rubles that caused your hand to burn as it was probably from the Chernoble area. They loaded them off on foreighners. Shortly after we returned home we read about their lop. The population was given a very short time to exchange their old rubles for the new ones. Most of them couldn't get into the bank in time to do it, so many people lost what they had because of the lop. Seven years later we were back in Russia and this time they were trying to get away with loading the old bills off on foreighners. LOL always something! Brietling's assessment that a lop wouldn't be that bad,he should ask the Russians how they felt about it. Climber7 http://www.arkdiscovery.com/ark-cov-index.htms this is the linc to the information about Ron Wyatt's discoveries. Fascinating read! Eagle Eye, thanks for posting your book linc. I 'm glad you have completed it. Have you read anything about Ron Wyatt's discovery of the Ark of the Covenant back in the early 80's? It was discovered 20 feet below where Jesus died and the blood flowed down and was sprinkled on the mercy seat. They had the blood tested and it was incredible!!! We have been in this investment for almost 9 years. Back when the chat page was really active there was a fellow Dinar vet who claimed he and his father had invested in the the Kuwait dinar. (I believe his name was Ronan 77 or something similar) He said back then there were no sites like this to help them keep an eye on their investment, but they knew someone over there and when the Kuwait dinar started to become active their contact kept them up on things. They didn't immediately cash in, but waited their time. He said it was very volatile and when it went over $2.00 per dinar they cashed in. 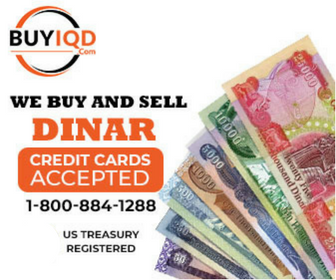 At one point it shot up over $7 per dinar and then settled back down to around $2.50. I realize the Iraqi dinar is a totally different event, but some of these articles have me wondering if we will see similar volatile activity with the Iraqi dinar when it is finally allowed to float. Very low denominations are not worth a fraction of the cost of the paper they are printed on without a significant adjustment to the rate of exchange. I hope this happens soon! Perhaps Abadi is needing the Kurds support to become Prime Minister again...so... What do the Kurds have #1 on their wish list??? HCL, baby!! !